Power that the people had given go to President Maithripala Sirisena was being used by others, former President Mahinda Rajapaksa said on Saturday. The former President, addressing a Daham Hamuwa, at Kacchiwatte Purana Rajamaha Vihara in Galle said: “I was told by one of the participants at this ceremony short while ago that during my tenure the number of members in the cabinet was high but now the number of executive presidents in the country was high. There is some truth in that saying. There is a national executive council. There is no provision for such a thing even in the Constitution. That council has become a play pen of the JVP and TNA members. 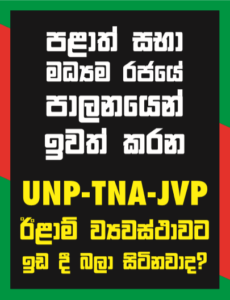 The JVP has become a branch of the UNP today. Not all the JVPers approve this situation. JVP leader Anura Kumara Dissanayake has a room in Prime Minister Ranil Wickremesinghe’s office. That was revealed to our members none other than the incumbent president. Although I cannot believe this, we have to accept it when it is said by the President! Mr. Rishad Badthiutheen, as being the person responsible for the encroachment and construction of houses for settling members of his community. I note that Mr. Badthiutheen is once again holding a cabinet rank in your administration as well. Sri Lanka Freedom Party Parliamentarians stressed that they need the resignation of the Central Bank Governor Arjuna Mahendran. Plans are already made to apply pressure on the government to meet their demand. A letter, regarding this issue and signed by MPs, will be handed over to Speaker Chamal Rajapaksa this week.